Giving Our Angel Wings to Fly...: Angelman Syndrome: Close to a Cure? Rebecca Burdine knew something was wrong the day her baby girl was born. Sophie was born without a natural sucking reflex, making it nearly impossible to eat. Later, it became clear that she had hardly any muscle strength at all. As the months passed, Burdine, a developmental biologist from Princeton University, grew more worried about her daughter's poor sleep patterns: short blocks of sleep interspersed with intense screaming fits. When she turned four months old, Sophie began having seizures, sometimes as many as three an hour. The first time Sophie suffered an Absence seizure, also known as a "petit mal" seizure, Burdine had no idea what was happening: "It was like watching TV when suddenly the screen turns to static, and then the channel comes back like nothing ever happened," she says. Several months later, Sophie was diagnosed with Angelman Syndrome, a genetic disorder marked by severe developmental delays, sleep disturbances, and oftentimes seizures. Actor Colin Farrell recently sparked interest in this relatively rare condition when he spoke publicly about his 7-year-old son James' diagnosis on the Ellen DeGeneres Show. The Irish actor discussed how his son's seemingly always happy demeanor and intense fascination with water caused James' pediatrician to test him for Angelman. As of last week, searches for Angelman Syndrome has spiked on Yahoo! , at one point becoming its third most trending topic. According to Burdine, the newly renewed interest in the disease could not come at a better time, as researchers are on the brink of finding a cure. "The dogma used to be that if you were born with a developmental disorder … that was it," said Dr. Paul Lombroso, director of the Laboratory of Molecular Neurobiology at Yale University. "This has all changed." Adds Burdine: "We now know the 'cards' can be re-dealt!" As opposed to other neurological disorders like autism and Alzheimer's, which affect many different genes, Angelman Syndrome only affects one: the UBE3a gene. Because researchers can pinpoint what causes the disorder—the absence of UBE3a—they were not only able to genetically alter a mouse to mimic Angelman symptoms, but they were able to successfully cure it. Tailoring that cure for humans is the logical next step, but funding is still needed to move forward. "Everyone talks about finding a cure: 'We're going to cure cancer, we're going to cure autism, diabetes, etc.' But we're actually talking about a cure here," Burdine said. "What's frustrating is that the only thing in the way is money." Burdine says that while Angelman is a relatively rare disease—affecting 1 in 15,000-20,000 births—curing it would be a gateway to finding a cure for other neurological disorders—like Alzheimer's and autism—as well as anything that affects learning and memory. "This is a chance where someone's investment can really pay off and they can see the results," she said. 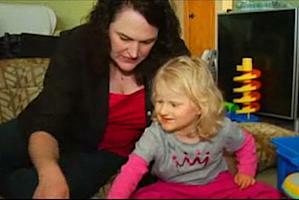 Now five years old, Burdine's daughter Sophie still can't walk or even sit up on her own. Without a chewing reflex, she is only able to eat pureed baby food. She is carried everywhere she goes, and still wears diapers. She also can't speak. "As much as I love my daughter's smiles and her giggles, I want to get rid of the seizures; I want her to be able to eat real food; I want to be able to talk to her: simplistic things that would be profoundly important for making her life better." To learn more about AS, and how you can help, visit CureAngelman.org.